Whisk together the eggs, flour and salt. Then add the soya milk and water until you have a smooth batter mixture. Using a good nonstick frying pan, heat a knob of butter and pour in enough mixture to coat the pan so it makes a nice thin crepe. Loosen with a spatula and flip to cook on both sides. Continue to make 4 crepes. In another small frying pan add the strawberries and a splash of brandy or kirsch and cook for 30 seconds. To serve take a dessert spoon of the Alpro soya dessert and using the back of a spoon, smooth over the crepes, fold in half and then again into quarters. 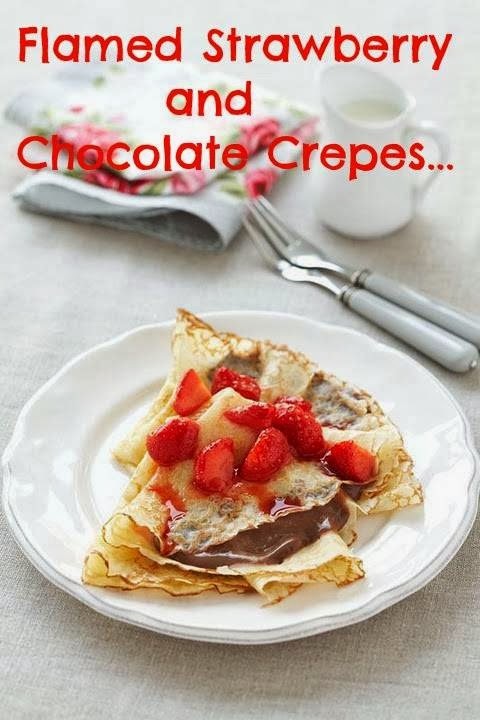 Continue with the rest of the crepes and top with the strawberries and a dusting of icing sugar. Serve two crepes per person. "Raspberry Shortcake Hearts: Great For Valentine’s Day"
"Blackberry Custard Tarts: Afternoon Tea Recipe"
Yummy! So. . . I see. . . you work out so that you can eat all of these yummy treats! LOL Lovin' your desserts! Tweeting this one. These look to die for! Delicious. Can't wait to try them!